Let’s be honest— puppies are cute and we all secretly (or not secretly) want to spend our days cuddled up with an adorable ball of fluff. But did you know, that getting a puppy can be a bit like gambling, even when you get a purebred. However, much like gambling…you can stack the odds in your favor! We’ve all heard that puppies start off with a blank slate…but how true is that and what does that mean? Even before conception, factors such as genetic heritage, mom’s stress during pregnancy, and environmental stimulus can influence your puppies future. How much time do you have to dedicate to a puppy? A highly social breed may not be able to tolerate being home alone all day. Will you adopt from an animal shelter, breeder, craigslist, or someone on the internet? If you can, find out about the parents personality. Were they calm and friendly or a little stand-offish? Dogs from different breed groups will be more likely to have specific breed traits that are very difficult to change. For example, if you get a Border Collie, there is a higher likelihood of them wanting to herd your children around the house by nipping at their heels. 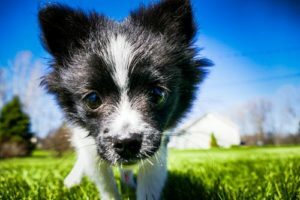 So this breed and dogs from the Herding Group will generally require you to provide more exercise, both mental and physical to keep them happy and healthy. Do you have an active life or a sedentary life? Do you have young children or plan to in the future? Congratulations! You have selected a puppy, now get ready for the real fun! I’ll let you in on a little secret…getting a puppy is like having a toddler. You will find yourself saying “what have you got in your mouth” and “go potty” more times than you care to know. The good news is you read this article and have a plan that will help make this a fun experience for everyone. Where will my puppy sleep, in a crate, in my bed, in their own bed? Who will be involved in the frequent potty outings your puppy will need every 1-2 hours? Will you need outside support from friends, dog walkers, trainers, and who will that be? Equipment: leash, harness, ID tags, dog bed, nail clippers, food bowls, tooth brush, toys, chews. What extra resources are you dedicating for vet care and unexpected expenses? For example, your puppy just swallowed a rock, sock, squeaker from toy, toxic plant, etc. requiring an unexpected emergency vet visit. Whether you choose a mixed breed rescue or a purebred from a reputable breeder, Training Spot is here to help. From socialization classesto pre-puppy consultations, we can get you and your puppy started off on the right paw. Won’t He Just Grow Out of It? Preventing Problem Behaviors. How to Stop Attention Barking! Puppy Socialization: Too much, too little, or just right? A Bored Dog is a Mischievous Dog!